Spring Break at Diamond H is the perfect trip for teens and young adults who like outdoor activities! 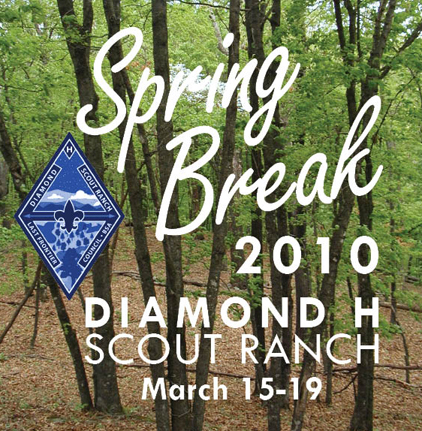 This year’s Spring Break is a unique collaboration between the Boy Scouts of America, Girl Scouts of the USA and Camp Fire USA. We have planned an exciting program of backpacking, GeoCaching, shooting sports, mountain biking, and Leave No Trace camping that will be enjoyable but challenging. Our staff leaders Ryan Lemons, Curtis Piper, and Mike Veasey are assembling Crew Guides and consultants to build on the success of past Spring Break Treks and include a Kodiak Leadership Training on this year’s adventure. View the brochure and the registration packet at www.lastfrontiercouncil.org. All youth must be at least 14 years old before March 15, 2010. Each participant must complete an Annual Health & Medical form parts A, B & C. The trek fee is $150 per participant. Sign up by March 1, 2010. Contact Ryan Lemons at ryan.lemons@scouting.org or (405) 840-1114 with any questions.